A fresh study by Transparency Market Research (TMR) has detected that the global brain tumor diagnosis and treatments market is fragmented among a large number of International players and a few regional vendors. In the near future, the report anticipates the competitive landscape to remain divided, although the players with financial might will continue to hold a significantly larger share of the pie. The report identifies GE Healthcare, Pfizer, Inc., AstraZeneca, Carestream Health, Merck & Co., Inc., Siemens Healthineers, Hitachi Medical Corporation, Philips Healthcare, Shimadzu Corporation, and Toshiba Medical Systems as some of the most prominent companies currently operating in the global brain tumor diagnosis and treatments market. The TMR report projects the demand in the global brain tumor diagnosis to increment at a healthy CAGR of 8.5% during the forecast period of 2017 to 2025, estimating it to be worth US$840.7 mn by 2025, mounting substantially from its evaluated valuation of US$406.0 mn in 2016. As far as the strategies of market leaders is concerned, the report expects investments in research and development of new products, geographical expansion, mergers and acquisitions, aggressive pricing, and collaborations to be at a forefront. The launch of new Vantage Galan 3T MR scan by Toshiba Corporation in November 2016 is a one such example of innovative product introduction. This product, which finds application in neurological cancer diagnosis, offers advanced imaging technique via improved high-quality imaging. Based on product-type, the segment of primary brain tumor diagnosis and treatments serve the maximum demand, accounting for nearly 74.7% of the global demand in 2016, with meningioma the most common product type. CT-Scan remains most profitable diagnosis category, whereas surgery is the most preferred primary treatment for brain tumor. Geographically, North America is most lucrative region, gaining most of the demand from the developed country of the U.S., although this report on the brain tumor diagnosis and treatments market projects Europe for the best growth rate among all regions. 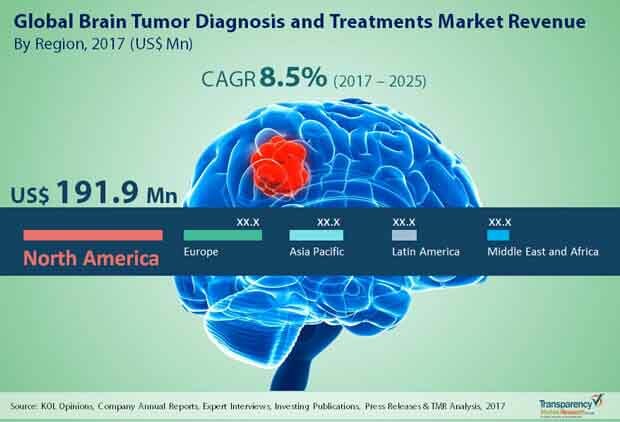 Increasing prevalence of brain cancer, innovations in drug delivery to brain cancer cells, and expanding market for the treatment of brain cancer associated symptoms are some of the key factors augmenting the demand in the global brain tumor diagnosis and treatments market. In addition to these factors, the healthcare sector is witnessing increasing public-private partnerships (PPPs), which is advancing the diagnostic imaging and radiology services. The advent of technologies such as Positron Emission Tomography (PET), Sodium Magnetic Resonance Imaging (23Na MRI), and Chemical Exchange Saturation Transfer (CEST) are now frequently employed to detect the response of brain tumors in multicenter clinical trial settings. malignancy will also favor the growth of the market for brain tumor diagnosis and treatments. On the other hand, exceptionally high cost of treatment is the most glaring restraint over the proper prosperity of the global brain tumor diagnosis and treatments market. Cost factors are restricting the expansion of the market in the emerging countries, despite them improving their healthcare infrastructure. Availability of only a few brain cancer specific drugs and increasing use of generics in chemotherapy are other two challenges faced by the global market for brain tumor diagnosis and treatments.